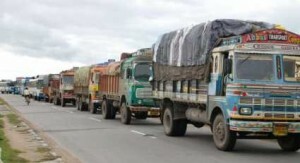 Cargo freight rates for 9-tonne pay load section for selected destinations dropped by INR 500 in the local truck transport market today following ample position of trucks in the markets. Transporters said sufficient position of trucks in the markets against cargo movements managed to pull down some centres’ freight rates. Delhi to Jaipur, Chandigarh, Ahmedabad and Patna freight rates were down by INR 500 each to INR 14,000, INR 16,000, INR 20,000 and INR 25,000, respectively. Jaipur-14,000, Hyderabad-56,000, Chandigarh-16,000, Vijayawada-58,000, Ludhiana-17,000, Bangalore-65,000, Kanpur-18,000, Chennai-63,000, Indore-19,000, Mysore-69,000, Ahmedabad-20,000, Pondicherry-64,000, Baroda-22,000, Coimbatore-69,000, Patna-25,000, Kochi-74,000, Surat-25,000, Thiruvananthapuram-77,000, Mumbai-26,000, Goa-51,000, Pune-28,000, Gwalior-13,500 Kolkata-29,000, Guwahati-52,000.